Social Security was by far the most powerful anti-poverty program in the United States last year, keeping 25.9 million people out of poverty. Refundable tax credits, such as the Earned Income Tax Credit (EITC) and the Child Tax Credit, kept 9.8 million people out of poverty. 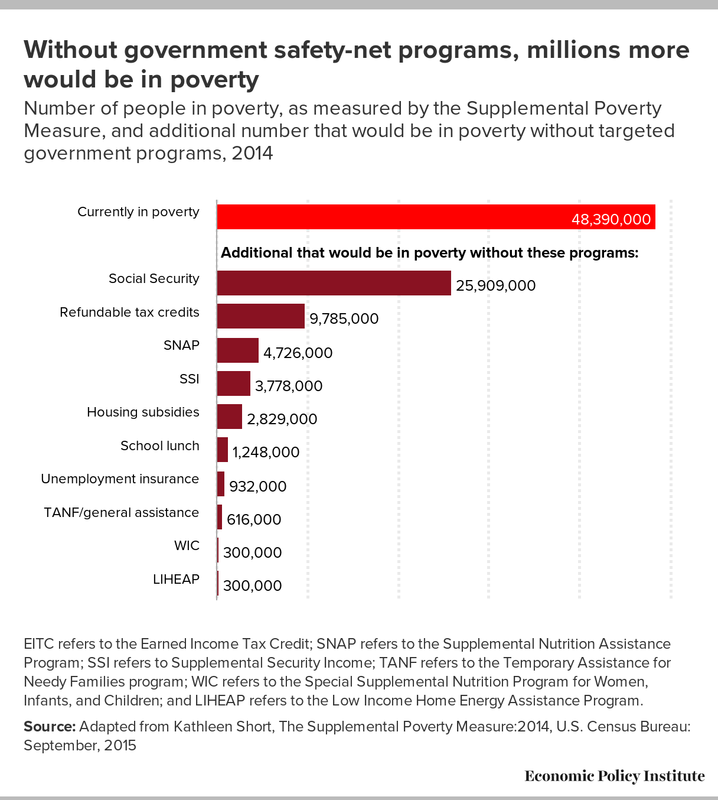 The Supplemental Nutrition Assistance Program (SNAP), aka food stamps, kept 4.7 million people out of poverty, while other targeted programs (such as housing subsidies, unemployment insurance, and school lunch programs) made it possible for millions more to keep their heads above water. In 2014, 48.4 million people (or 15.3 percent of the US population) were in poverty, as measured by the Supplemental Poverty Measure (SPM)—a more sophisticated approach for measuring economic well-being than the official federal poverty line. However, that number would have been significantly higher were it not for programs like the ones listed above. In the absence of stronger wage growth for low and middle-income workers, these safety-net programs play an increasingly important role in helping struggling families afford their basic needs. EITC refers to the Earned Income Tax Credit; SNAP refers to the Supplemental Nutrition Assistance Program; SSI refers to Supplemental Security Income; TANF refers to the Temporary Assistance for Needy Families program; WIC refers to the Special Supplemental Nutrition Program for Women, Infants, and Children; and LIHEAP refers to the Low Income Home Energy Assistance Program.